To CREATE a break line, click at the desired position. 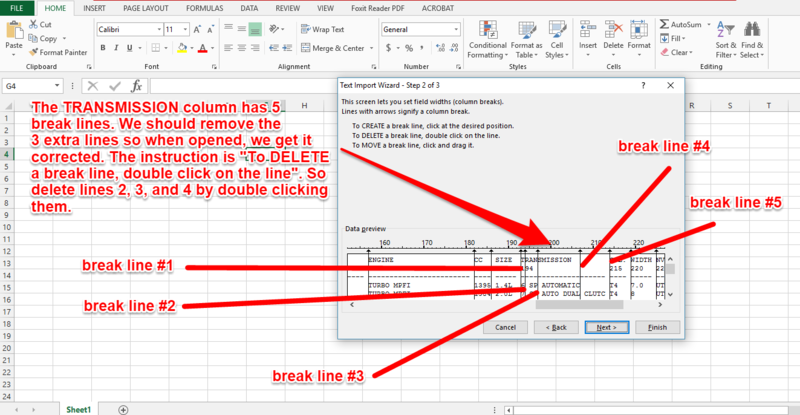 To DELETE a break line, double click on the line. Browse all columns because there are still others to correct. Then, hit NEXT again. These blank columns will be filled with quotes and commas. For COLUMN A, insert “(‘” [double quotes not included. 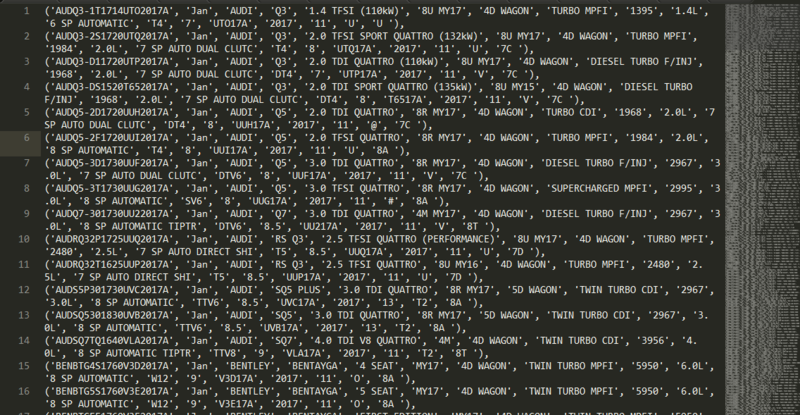 It’s only OPEN PARENTHESIS/SINGLE QUOTE], for columns B to AI, insert “‘, ‘” [double quotes not included. It’s only SINGLE QUOTE/COMMA/SPACE/SINGLE QUOTE]. And on the last column AK, insert “’),” [double quotes not included. It’s only SINGLE QUOTE/CLOSE PARENTHESIS/COMMA]. 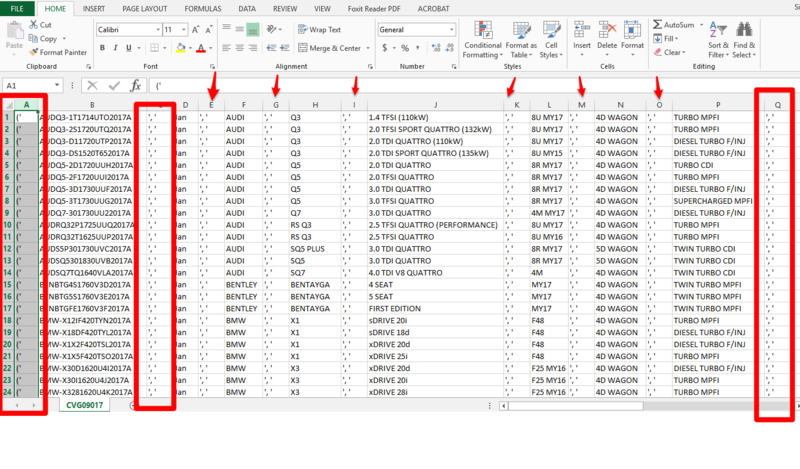 But on the last cell at the bottom of the COLUMN AK, insert “’);” [double quotes not included. It’s only SINGLE QUOTE/CLOSE PARENTHESIS/SEMICOLON]. The semicolon at the last cell is very important because it closes the statement. Failure here will break the import and produces error. 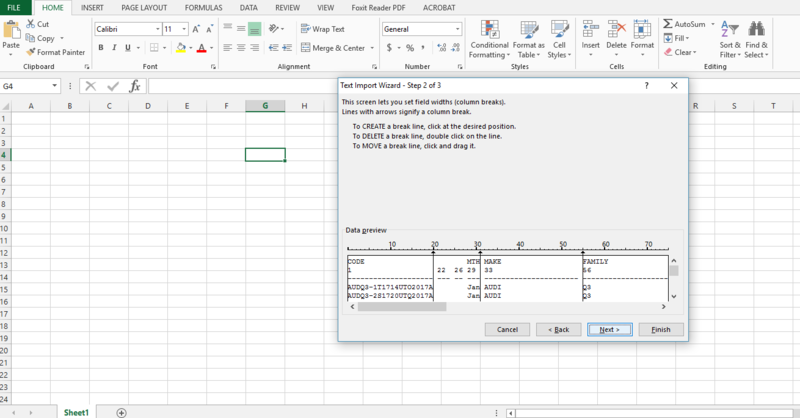 Then, SELECT ALL the text and copy and paste them into the exported .sql described below [bottom of this guide]. 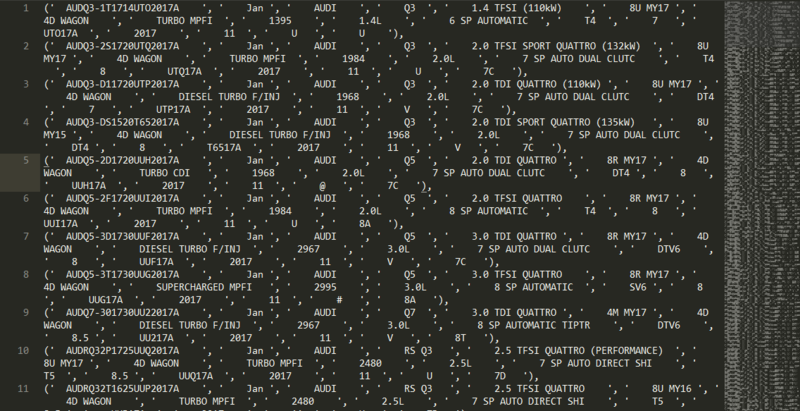 You will find the same structure in the .sql file. Replace them with this new one. 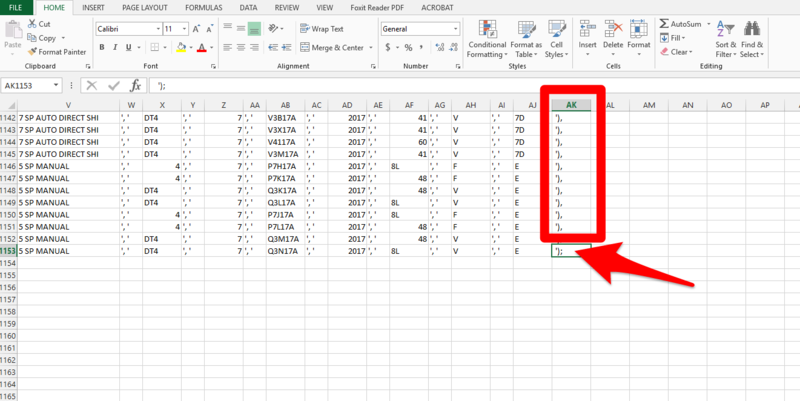 Replace only the text having the same format/structure and leave all others as-is. 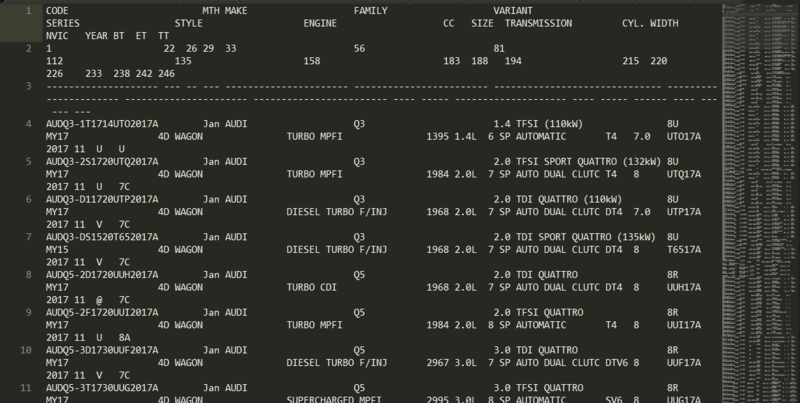 “carswantedcom_wp3_carmodels_table_only.sql” and “carswantedcom_wp3_prices_table_only.sql” are included in the zip file as sample. 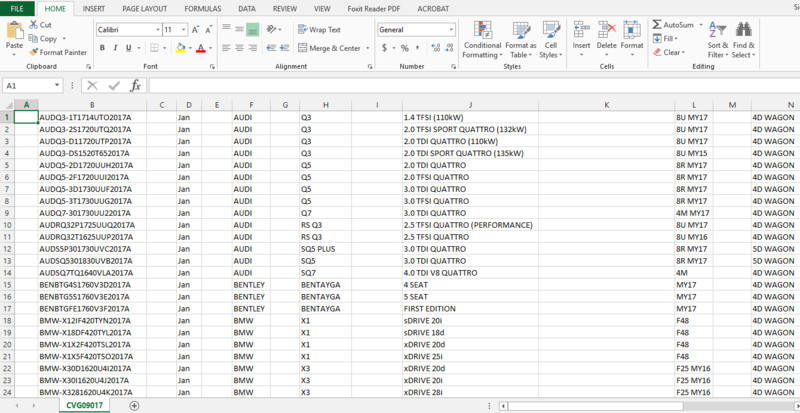 If you prefer the second option [empty “carmodels” and “prices” table and import the new one], just export these tables and use the exported .sql file as a template. 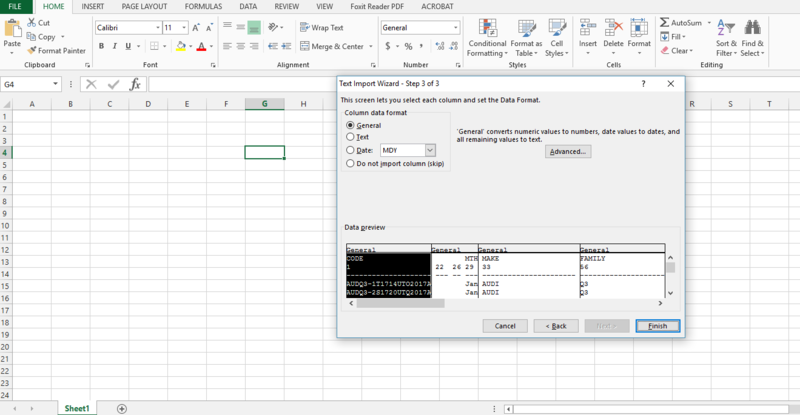 That template contains the same INSERT statement plus extra database stuff. 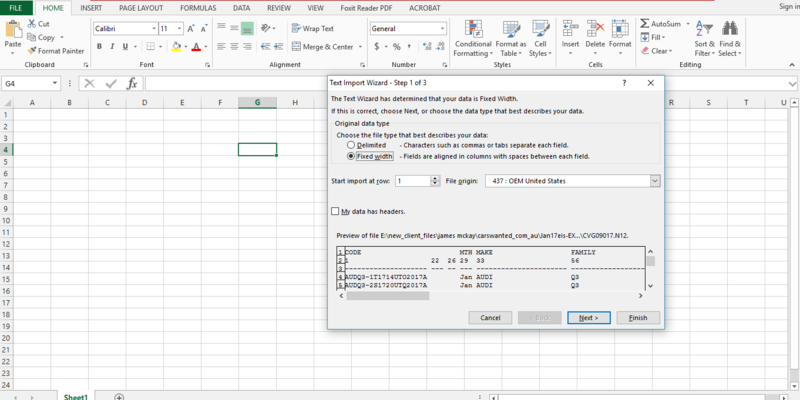 Since it has no IGNORE, modify and make it INSERT IGNORE INTO and just replace the content of the rows to reflect the new values. 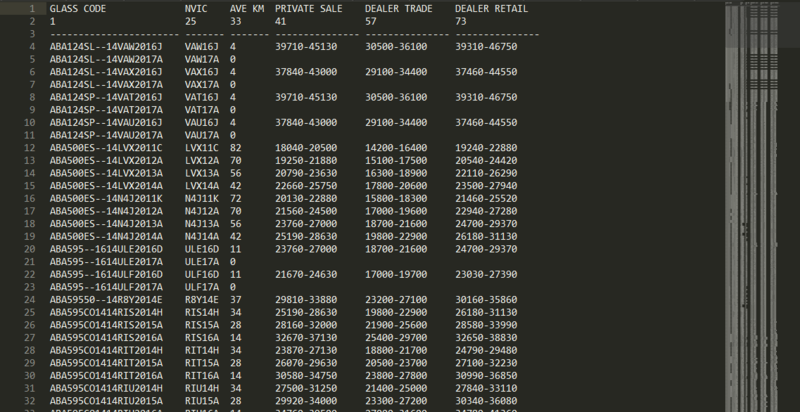 Then, save and import that modified .sql file into CW database using PHPMyAdmin or any preferred client.